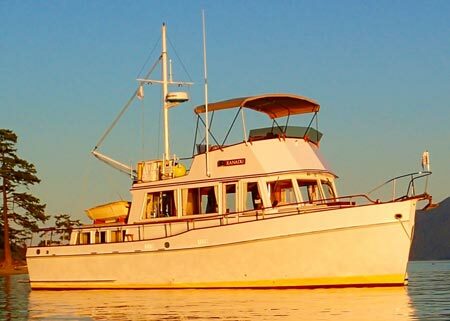 Xanadu was built in Hong Kong in 1971 of Philippine mahogany planks on yacal frames. Her interior is mostly teak. She is powered by a single John Deere diesel engine of 225 horse power at a cruising speed of 8 to 9 knots, consuming from 2 to 3.5 gallons per hour. With a fuel capacity of 640 gallons, she is able to travel from Olympia, WA, to Ketchikan, AK, with fuel to spare. The interior is divided into a main salon and galley, an aft stateroom with double bed, and a forward stateroom with v-berth. Each stateroom has its own head. Xanadu’s current owners, John and Roxana Caples, have been her caretakers since the dawn of the new millennium. They have cruised her extensively, as far south as San Diego, CA, and as far north as Glacier Bay, AK.